After 3 fantastic days in Phuket, our family of four flew to Thailand's bustling capital via a local budget airline. Being the focal point of a popular Southeast Asia travel route, I was pretty excited to see Bangkok for the first time. I think, there's no better way to make the trip more distinct than having a glimpse of the local culture! 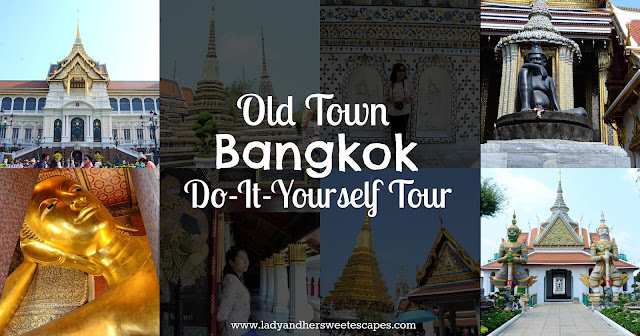 I'm super happy that I stumbled on to Big Boy Travel's Old Town Bangkok Walking Tour while I was doing my research. The self-guided trail came in handy. I got spoon-fed, I must say! So, I laid out a DIY tour plan; not as detailed and as packed as Big Boy Travel's itinerary, but a simplified version that includes the 3 must-see Wats in Bangkok. Thankfully, my parents were game with it! We ventured out to Rattanakosin - Bangkok's old city. It is cultural district dotted with shimmering Wats, historical structures and majestic palaces. To get there from our accommodation, we took the BTS and alighted in Saphan Taksin. The station is adjacent to Sathorn (Taksin) pier. From Sathorn Central Pier, we rode the Chao Phraya Express Boat that runs through the major landmarks. It's a scenic ride, informative as well because the historical details are shared by a staff over the microphone. Other tourists preferred hiring a longtail, a traditional colorful boat which is fondly called the "gondola of the South". It's more expensive though. Ed preferred to stay in the boat's bow for a much scenic ride. We hopped off at Tha Tien station and took the river crosser to Wat Arun. Not to be confused with the express boat, the river crosser is a boat that transports people to the opposite bank and not to the next pier. Our first destination in Old Town Bangkok is Wat Arun. It is one of Bangkok's oldest temples, popular for its impressive prangs that dominate the skyline along Chao Phraya River. I think it is best to see it at sunrise, when the first light of the day shines on its surface. It wouldn't be called the Temple of Dawn for nothing. The hotel that I booked is located far off the old town, hence no sunrise viewing for us. No climbing on the central prang either as the temple was under renovation. We sure missed a lot during our visit, but it was still remarkable. Wat Arun still looks magnificent despite the scaffolding. Still impressed with the mosaic patterns despite the scaffolding. Notice how intricate the patterns on the surface of the prang! We played dress up in Wat Arun! Rented the costumes for 250 Baht. Heheh. We went back to Tha Tien station via the river crosser to visit the next attraction on our list... Wat Pho! The temple complex is a home to Bangkok's largest reclining Buddha. Upon getting our tickets, we claimed the free drinking water (It was a hot summer day!) and headed to the building where the famous Buddha image is sheltered. The Reclining Buddha is impressive in size and in details. The gigantic gold plated structure rests in a mosaic-encrusted pillow. Its soles are in-laid with mother of pearl. We were all in awe from the moment we stepped in the entrance door until we reached the exit! Wat Pho is also Thailand's first public university. It is the birthplace of Thai massage. Shame that I wasn't able to have one as the queue was quite long and my stomach was already grumbling! Before heading to another must-see attraction in Bangkok, we stopped by a lane of eateries across Wat Pho. I didn't have a specific restaurant in mind. Well, I actually didn't include food stops while planning for this walking tour. I said, we'll just eat whenever and wherever we're hungry. But it turned out that the small eatery I spontaneously picked is quite popular to people who are into food, art and culture! I love everything about AMA Art & Eatery. Dishes are authentically delicious. Portion is just right for its price. Service is quick (Yey for us who were in hurry) and friendly! 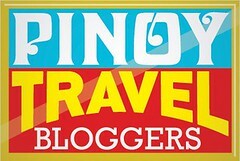 Ambiance is terrific; cool music, artsy decors, positive vibes! While rushing to the entrance gate of the Grand Palace, we passed by a street side amulet market. Curious as I always am, I quickly browsed through the charms although I don't really intend to buy one. There are different kinds. I overheard a vendor saying "This for protection. That for good luck." I made the Grand Palace our last stop for our Old Town Bangkok DIY Tour. Not quite a good decision as the complex was packed in the afternoon! It's the most crowded tourist attraction I have visited to date. The Grand Palace is a sprawling complex composed of the former residence of the King, ceremonial halls, museums and temples. The highlight of the complex is Wat Phra Kaew. Tourists flocked around the glittering temple, endured the long queue to see the Emerald Buddha - a jade statue considered to be Thailand's most holy image. It was a bit overwhelming. I was impressed, but because it was too crowded, too hot and we were in a hurry as it was two hours before closing, I didn't get to appreciate the structures thoroughly. It was only when I checked the photos after the trip that I realized how intricate and how relevant The Grand Palace is. Surely, not be missed when in BKK. From the Grand Palace, we walked to the nearest pier and hopped in a Chao Phraya Express Boat heading back to Sathorn. It was a tiring yet fulfilling day in Old Town Bangkok. I went back to the hotel with a headache and three things to keep in mind if I'll be doing this walking tour again: 1. Start early. 2. Keep hydrated. 3. Take it slow! Started and ended the tour at the city's major waterway, Chao Phraya River - the River of Kings!